Adobe is essentially a dried mud brick, combining the natural elements of earth, water, and sun. It is an ancient building material usually made with tightly compacted sand, clay, and straw or grass mixed with moisture, formed into bricks, and naturally dried or baked in the sun without an oven or kiln. In the United States adobe is most prevalent in the hot, arid Southwest. Although the word is often used to describe an architectural style — "adobe architecture" — adobe is actually a building material. Adobe bricks have been used around the world, including near the muddy river areas of ancient Egypt and the ancient architecture of the Middle East. It is used today but also found in primitive architecture — mud bricks were used even before the grand ancient stone temples of Greece and Rome. Construction methods and the composition of adobe — the recipe — vary according to climate, local customs, and the historical era. Its strength and resilience vary with its water content — too much water weakens the brick. Today's adobe is sometimes made with an asphalt emulsion added to help with waterproofing properties. A mixture of Portland cement and lime may also be added. In parts of Latin America, fermented cactus juice is used for waterproofing. Although the material itself is naturally unstable, an adobe wall can be load bearing, self-sustaining, and naturally energy efficient. Adobe walls are often thick, forming a natural insulation from the environmental heat that creates and sustains the material. Today's commercial adobe is sometimes kiln-dried, although purists may call these "clay bricks." 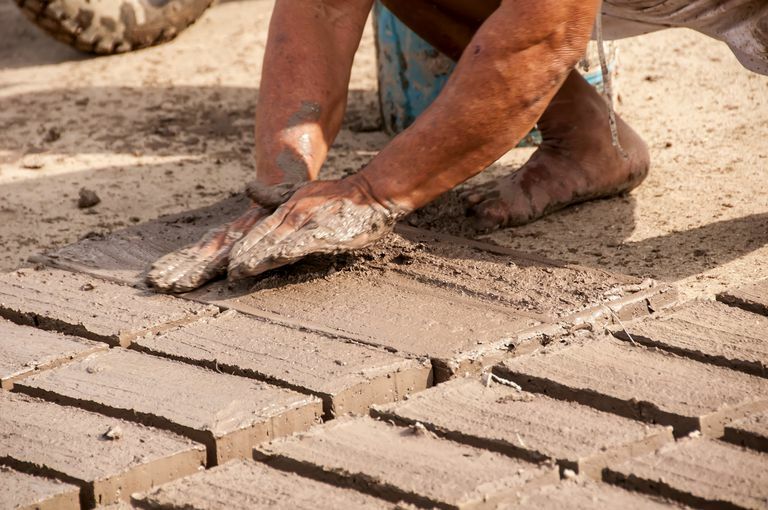 Traditional adobe bricks need about a month of drying in the sun before they can be used. If the brick is mechanically compressed, the adobe mixture needs less moisture and the bricks can be used almost immediately, although purists may call these "compressed earth bricks." In the United States, the word adobe is said with the accent on the second syllable and the last letter pronounced, as in ah-DOE-bee. Unlike many architecture words, adobe does not originate in Greece or Italy. It is a Spanish word that does not originate in Spain. Meaning "the brick," the phrase at-tuba comes from Arabic and Egyptian languages. As Muslims migrated across northern Africa and into the Iberian Peninsula, the phrase transformed into a Spanish word after the eighth century A.D. The word entered our English language through the colonization of America by Spain after the 15th century. The word is widely used in the southwestern United States and Spanish speaking countries. Like the building material itself, the word is ancient, going back to the creation of language — derivations of the word have been seen in ancient hieroglyphics. Compressed Earth Blocks (CEBs) resemble adobe, except they usually do not contain straw or asphalt, and they generally are more uniform in size and shape. When adobe is NOT formed into bricks, it's called puddled adobe, and is used like the mud material in cob houses. The material is mixed and then thrown in lumps to gradually create an earthen wall, where the mixture dries in place. In the Natural Building Blog, Dr. Owen Geiger, Director of the Geiger Research Institute of Sustainable Building, contends that Native Americans used puddled adobe before the Spanish introduced adobe brick-making methods. Adobe is resilient if well-maintained. One of the oldest known structures in the U.S. is made from adobe bricks. Preservationists at the National Park Service of the U.S. Department of the Interior provide guidance on historic preservation, and their Preservation of Historic Adobe Buildings (Preservation Brief 5) published in August 1978 has been the gold standard for keeping this building material maintained. Constant monitoring of deterioration sources, including the breakdown of mechanical systems like leaky plumbing, is the most important part of maintaining an adobe structure. "It is the nature of adobe buildings to deteriorate," we are told in Preservation Brief 5, so careful observation of "subtle changes and performing maintenance on a regular basis is a policy which cannot be over emphasized." Problems usually have more than one source, but the most common are (1) poor building, design, and engineering techniques; (2) too much rainwater, ground water, or watering of surrounding vegetation; (3) wind erosion from windblown sand; (4) plants taking root or birds and insects living within the adobe walls; and (5) previous repairs with incompatible building materials. To maintain historic and traditional adobe, its best to know traditional methods of construction so that repairs can be compatible. For example, true adobe bricks must be assembled with a mud mortar of properties similar to the adobe. You can't use cement mortar because it's too hard — that is, the mortars cannot be stronger than the adobe brick, according to preservationists. Foundations are often constructed of masonry red brick or stone. Adobe walls are load-bearing and thick, sometimes braced with buttresses. Roofs are usually wooden — flat, with horizontal rafters covered with other materials. The familiar vigas projecting through the adobe walls are really the timber parts of the roof. Traditionally, the roof was used as additional living space, which is why wooden ladders are often propped up alongside an adobe home. After the railroads enabled the transport of building materials to the American Southwest, other roof types (e.g., hipped roofs) began to appear atop adobe brick buildings. whitewash, a mixture preservationists describe as "ground gypsum rock, water, and clay"
Unless you're a professional, don't try to fix it yourself. Patching and repairing adobe bricks, mortar, rotting or insect-ridden wood, roofs, and surfacing agents should be handled by seasoned professionals, who will know to use matching construction materials. Repair any problem sources before anything else. For repairs, use the same materials and building methods that were used to build the original structure. "The problems created by introducing dissimilar replacement materials may cause problems far exceeding those which deteriorated the adobe in the first place," preservationists warn. Since the first Earth Day, people from all walks of life have found a calling advocating for natural building methods that will help save the earth. Earth-based products are naturally sustainable — you are building with the materials that surround you — and energy efficient. The folks at Adobe is not Software are just one of many groups in the Southwest devoted to promoting the benefits of adobe construction through training. They offer hands-on workshops on both making adobe and building with adobe. Adobe is more than software even in the high-tech world of southern California. Most of the largest commercial manufacturers of adobe brick are in the American Southwest. Both Arizona Adobe Company and the San Tan AdobeCompany are located in Arizona, a state rich in the raw materials needed to manufacture the building material. New Mexico Earth Adobes has been producing traditionally made bricks since 1972. Shipping costs can be more than product costs, however, which is why architecture made with adobe is mostly found in this region. It takes thousands of adobe bricks to construct a modest-sized home. Although adobe is an ancient method of contruction, most building codes tend to focus on post-industrial processes. A traditional building method like building with adobe has become non-traditional in today's world. Some organizations are trying to change that. The Earthbuilders’ Guild, Adobe in Action, and the international conference called Earth USA help keep the mixtures baking in the heat of the sun and not in ovens run by fossil fuels. Pueblo Style and Pueblo Revival: Adobe construction is most closely associated with what is called Pueblo architecture. A pueblo is in fact a community of people, a Spanish word from the Latin word populus. The Spanish settlers combined their knowledge with the terraced communities occupied by the people already living in the area — the indigenous people of the Americas. Monterey Style and Monterey Revival: When Monterey, California was an important seaport in the early 1800s, the population centers of the new country called the United States were in the East. When New Englanders like Thomas Oliver Larkin and John Rogers Cooper moved West, they took with them ideas of home and combined them with local customs of adobe construction. Larkin's 1835 home in Monterey, which set the standard for the Monterey Colonial Style, exemplifies this fact of architecture, that design is often a mixture of features from different places. Mission and Mission Revival: When the Spanish colonized the Americas, they brought the Roman Catholic religion. The Catholic-built "missions" became symbols of a new way in a new world. Mission San Xavier Del Bac near Tucson, Arizona was built in the 18th century, when this territory was still part of the Spanish empire. Its original adobe brick has been repaired with low-fired clay brick. Spanish Colonial and Spanish Colonial Revival: Spanish style homes in the New World are not necessarily constructed with adobe. The only true Spanish colonial homes in the United States are the ones that were built during the long Spanish occupation from the 16th to 19th centuries. Homes from the 20th and 21st centuries are said to "revive" the style of the Spanish homeland. However, the traditional construction of a house in the medieval town of Calatañazor, Spain shows how this method of construction moved from Europe to America — the stone foundation, the overhanging roof, the timber beams for support, the adobe bricks, all ultimately hidden by a surface coating that defines the architectural style.